NAD C 556 review | What Hi-Fi? Good artists copy, great artists steal, so the saying goes. But what is there to say about those who take somebody else’s work and turn it into something slightly different… the NAD C 556 turntable, for instance, which uses the standard Rega RP1 as a canvas, but gives it a few small tweaks? The C 556 gets a new lick of paint, for starters, but it also has an “advanced molecular-vapour deposited coating” on the chassis, specified to the Pantone of the coatings in other NAD C-series products. There’s a new cartridge too. Although NAD was happy with the basic design of the RP1, the cartridge is something that Rega makes, as specified by NAD. With a new colour and new cartridge, it’s less NAD and more ‘NAD presents’. You can’t even really tell the difference from afar, as the only branding is a tiny badge, tucked away under the tonearm. Elsewhere, it’s the same Award-winning Rega RP1 turntable that stole our hearts in 2011, earning a five-star review in the process. It’s about as simple as record players get. It has a plain rectangular plinth, which features a well-made main bearing, three rubber feet and Rega’s RB101 tonearm – a simplified take on the highly regarded RB300. The motor has a stepped pulley, which means speed change is manual. Want to spin singles? You’ll have to take the platter off and move the belt. The platter itself is made of a pressure-cast phenolic resin (fancy plastic chosen for its mass and sonically inert properties). Set-up is easy and the cartridge comes pre-installed. The ideal position for the counterweight is marked, so you slide the weight on until it won’t go further. Adjust the anti-skate with a small slider under the tonearm and you’re good to go. As with all turntables, correct positioning is important to get the best out of your records. You’ll need a level, stable surface, away from sources of external vibrations, such as your speakers. The NAD produces an excellent sound for the money. It’s an insightful listen, capable of stripping back layers otherwise obscured by lesser candidates. Whether you spin a well-worn favourite or a newly-pressed discovery, it digs up plenty of information. In either case it’s a confident, surefooted delivery that has no problem holding your attention. Elsewhere, dynamics are strong and timing is tight. Put it together and you have a rounded performance that ticks all the right boxes. The NAD faces strong competition in the form of another modified Rega RP1 – the Performance Pack. Against this, it is obvious that the NAD is a step down in terms of refinement, dynamism and transparency. Don’t let that put you off though, because the NAD’s smaller price tag evens things out considerably. We’re impressed by the NAD C 556. 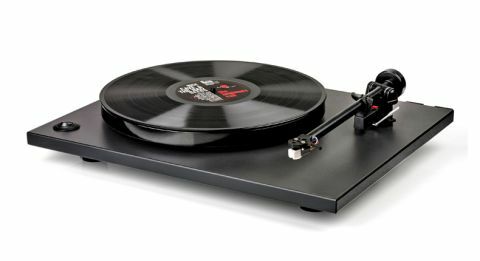 It may only be a small tweak of the original Rega RP1, but the results speak for themselves. We’d encourage you to seek one out for an audition.